The NOVA e- Series of surface area analyzers offers a full line of rapid, high throughput B.E.T. surface area and pore size analyzers. Eight fully automatic models meet the needs of any research or quality assurance laboratory. All NOVA models can produce BET surface area results using the classical helium void volume method, or via the patented helium-free method. 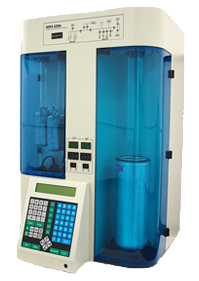 Every NOVA is also a pore size analyzer capable of measuring both adsorption and desorption isotherms in a few hours, completely unattended. Different combinations of surface are analysis and pore size anlysis can be performed simultaneously.